Add summer flair to grilled steak by topping those filets with the classic salad of tomatoes, fresh mozzarella, and basil. Caprese Grilled Filet Mignon is a simple way to dress up some amazing Certified Angus Beef® brand filets with some of the freshest ingredients of summer. After simply seasoned with salt and pepper and grilling filet mignon, it is then topped with juicy tomatoes, fresh mozzarella, basil, and a balsamic reduction for an easy dinner recipe that is also a little extra special. 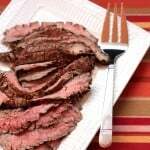 This filet mignon recipe is not only delicious, it is also naturally gluten free and low carb. Disclosure: This​ ​post​ ​is​ ​sponsored​ ​by​ ​the​ ​Certified​ ​Angus​ ​Beef​ ​®​ ​brand​ ​in​ ​conjunction with​ ​a​ ​social​ ​media​ ​campaign​ ​through​ ​Sunday​ ​Supper​ ​LLC.​ ​All​ ​opinions​ ​are my​ ​own. We would have been happy to simply take these gorgeous steaks, season them with salt and pepper, toss them on the grill, and enjoy the amazing flavor and juiciness that comes from the perfect marbling. But I thought I’d add a little summer flair by simply topping those filets with some tomatoes, fresh mozzarella and basil, then finishing it off with a drizzle of reduced balsamic vinegar. Yes, by putting it atop the best beef in the business, everyone’s favorite summertime salad becomes a fabulous main course in this Caprese Grilled Filet Mignon recipe. I still can’t believe we have been living in Maryland for a few years now, and I am looking back on this post I wrote when we lived here only about six or seven months. I still tell people we just moved to the area. I guess when you live somewhere for 35 years, seven months pretty much feels likes just a small moment in time. I’m still learning my way around, and have a sense of pride that warrants an immediate text message to The Hubby whenever I drive to or from somewhere successfully without turning on my GPS. I still don’t love the grocery stores, and feel like I need to go to a few different ones just to get the same selection from my favorite one back in New Jersey. But the kids are all set up with schools, a doctor, and a dentist, and The Hubby and I are working on that as well, we found some fabulous parks, met a few neighbors, and we only have a couple of small piles of not-yet-unpacked boxes. I have to say, though, the thing that I am still having the hardest time with is the local restaurant selection, or lack thereof. There are plenty of good places if you are willing to drive at least a half hour to an hour away, but with the traffic in and out of DC, venturing that far with two hungry little dudes at that time of day in Montgomery County is not always the most brilliant idea, and right around us the options are limited. But we have found a couple of places that we have actually returned to several times for both good food and a great atmosphere for families – not a combination you find often. Not Your Average Joe’s is near The Hubby’s office, so if he is going to be a little late on a Friday night and we want to go out, I can pack up the boys and meet him there. The menu is so creative, and they have new specials every month which keeps it interesting to keep going back. We also celebrated both Easter and Mother’s Day there. And GrillMarx is the steakhouse right around the corner from us where The Hubby and I can order a fabulous meal and glass of wine, and the kids menu actually makes both kids and mama happy – homemade mac and cheese, freshly made burgers, and options for veggies and salads on the side. This is another special occasion place for us, as we enjoyed their Sunday Brunch for Palm Sunday, and dinner after The Bug’s pre-school graduation. While I love trying new places, it’s nice to have a couple of tried and true restaurants to fall back on. But as I was preparing for this week’s event, I realized another reason why I love these two places – they are two of the closest restaurants to me that serve Certified Angus Beef® brand, which I have actually enjoyed at both places on a couple of occasions. Not Your Average Joe’s has an amazing wedge salad with sliced steak and a horseradish dressing that is to-die-for, and I ordered a perfectly grilled Petite Tender steak at GrillMarx a couple of weeks ago. 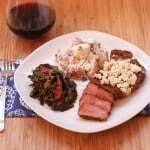 While the accompaniments were delicious, it’s truly the beef that made the meals. You see, Certified Angus Beef® brand is truly a cut above even Choice and Prime steaks – it’s the best Angus beef available! With ten demanding quality standards to meet, Certified Angus Beef® brand is truly the best Angus beef available, since not only must these standards be met, expectations are usually exceeded. This is a brand that people have come to rely on for consistently flavorful, tender, and juicy cuts of meat since 1978. I mean, you wouldn’t find it in nearly 15,0000 of the most elite restaurants and retailers around the world if it wasn’t such high quality. And I’m lucky enough to be able to enjoy it at some of my favorite local dining establishments. Caprese Grilled Filet Mignon makes a Certified Angus Beef® brand steak even better! The fresh ingredients balancing the rich flavor of the Certified Angus Beef® brand was just a perfect pairing. My littlest and biggest carnivores were thrilled with this dinner. And me, well I savored every last morsel! Season your filet mignon with salt and pepper and brush with olive oil. Prepare your steak topping by slicing tomatoes and mozzarella and pulling the basil leaves off of the stems. You can buy a bottle of balsamic reduction or you can check out these instructions for how to make balsamic glaze. Grill the steaks about five minutes per side to medium rare perfection. At this point you have two options depending on your preference. You can place the tomatoes, basil, and mozzarella on top of the steaks and give them a couple more minutes on the grill to melt the cheese a bit. Or you can take the steaks off and add the Caprese salad toppings for a cooler, crisper contrast to the steak. Either way is delicious, so it’s your call. Perfectly grilled steaks are simply seasoned and topped with the ultimate summer combination of tomatoes, fresh mozzarella, and basil, then finished with a drizzle of balsamic reduction. Inspired by the classic Caprese salad, this simple addition to your filets take them from everyday to extra special when you want to make an amazing dinner on the grill. Heat grill to high. Place steaks on grill, reduce heat to medium. Cover and cook for 5 minutes. Flip and cook for an additional 5 minutes. At this point you have two options. Remove steaks from the grill and top with one tomato slice, one basil leaf, one slice mozzarella, another basil leaf, and another slice of tomato and serve as is. Or you can reduce heat to low, top with one tomato slice, one basil leaf, one slice mozzarella, another basil leaf, and another slice of tomato. Then close the cover and grill for another 3-5 minutes or to desired doneness. Remove to a platter, let rest for at least 5 minutes, drizzle with reduced balsamic vinegar before serving. Is your mouth watering yet? 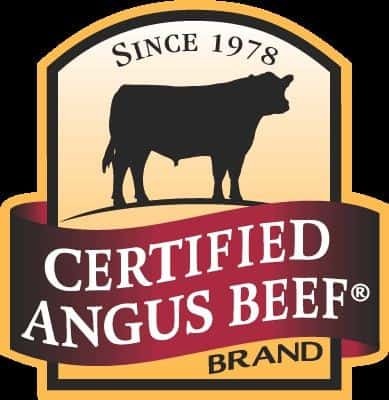 If you are craving some amazing beef, make sure you get more information about Certified Angus Beef® brand on their website, find out where to buy their beef, plus get tons of information and recipes ideas by following them on Facebook, Twitter, Pinterest, Instagram, and YouTube. I made this tonight – it was divine!!! I am normally not a steak lover – I could take it or leave it. But I love caprese salads. This combination was sooooooo yummy!!!!! I will definitely make this again. Thank you for dreaming this up!! Happy Friday! 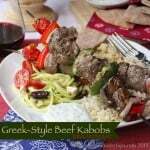 Just letting you know I featured this recipe for my weekly Low-Carb Recipe Love on Fridays! I hope a lot of my readers will click over and try it. Such a gorgeous looking steak! Love the caprese addition! So yummy! Caprese ANYTHING for me, please, but when you put it on top of an Angus steak…well, that’s just perfect. I love that you combined the filets with the classic summer salad. These steaks just scream summer flavors! Caprese goes great with steak. Looks and tastes great! I’ve moved a lot over the years and I always have trouble answering the question “where are you from”. A lot of places kind of feel like “home”, but at the same time not necessary one in particular! This filet = totally drool worthy and oh so summery with the caprese salad topping. Love it! This looks so delicious and the flavors sound so awesome! Not to mention it is gorgeous! We have lived in our area for almost 5 years now and I still have to pull my GPS out when going somewhere I don’t go too often! Your filet looks AMAZING! The colors, the flavors, the textures. Perfect! What a fresh and delicious idea to top your steak with caprese! This looks absolutely mouth-watering….perfect for summertime grilling! My mouth is watering — my fave salad combined with a juicy steak. Brilliant! A filet is always my choice of steak—and next time I’ll make sure to have Caprese toppings on hand! What a marvelous idea! Taking the best summer salad and combining it with great steak is simply divine! It truly was! Might have to make it again today!